If you’ve read our free seed starting ebook or watched our seed starting video classes, then you might have noticed a brief overview of Ladbrooke soil blockers. 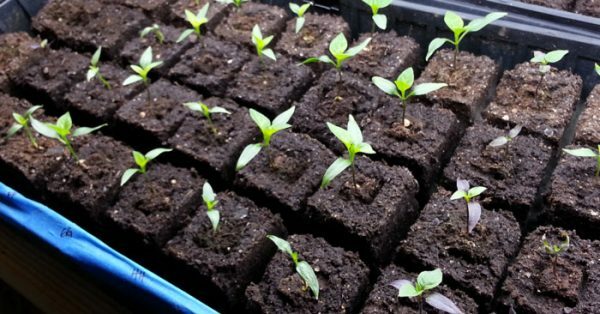 There are lots of different ways to start seeds: direct sowing outdoors, starting indoors in plastic cells, starting indoors in biodegradable pots, etc.. There is no SINGLE right way to do things for every seed variety, and each seasoned gardener we know ends up developing their own preferences after many years of trial and error. 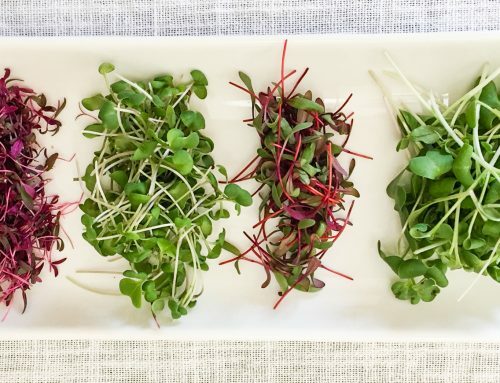 Often, like us, this means they use different methods depending on the seed variety they’re starting. Do you HAVE to use Ladbrooke soil blockers? Nope. But for certain gardeners growing certain seed varieties there are some very big benefits that make Ladbrookes a great choice. 2″ soil blockers and organic artichoke seeds. Plants that traditionally don’t do well in plastic cells because they don’t like to have their roots disturbed often transplant nicely when started in soil blocks. Why Use Ladbrooke Soil Blockers? We always use Ladbrooke blockers when starting seeds that benefit from, or require, germination temps higher than our indoor air temps (which are usually around 70°F when we’re starting our summer seeds indoors in February). This includes our favorite nightshades like tomatoes (germ temps 75-85°F), eggplants (75-90°F), tomatillo (70-90°F), peppers (70-95°F), and ground cherries (75-85°F). Nope, Ladbrooke soil blocks aren’t warmer on their own right, we have to put them on a heat mat and use a heat mat thermostat to bring the soil temps up into the ideal temperature range for optimal germination. That means, compared to plastic cells or biodegradable pots, the Ladbrooke Micro blocks provide anywhere from 3x – 10x more space efficiency. So unless you want to buy 3-10 more heat mats, Ladbrooke blockers work great when you’re starting a lot of seeds that require high germination temperatures. Another big benefit of Ladbrooke soil blockers – less waste. You don’t have to buy new plastic seed cells or biodegradable pots if you use Ladbrookes. Seedlings in soil blocks getting big! You’ve got the why figured out, but how in the heck do you use these newfangled Ladbrooke soil blockers to grow seedlings? 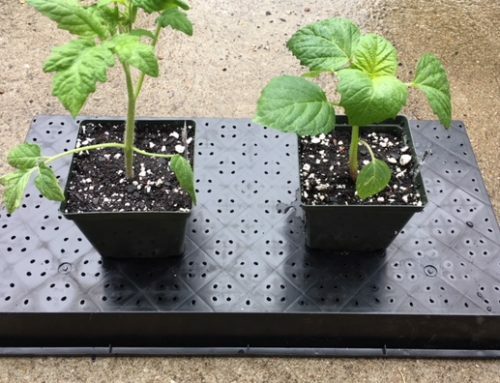 since standard 1020 seed trays have ridges on their bases, the micro blocks will need to have additional support to stabilize their foundations and ensure they don’t tip or fall over. The cheapest solution is to cut out a piece of cardboard (to provide strength) and put a piece of parchment paper over the cardboard to keep the soil block roots from growing into the damp cardboard. Because we use soil blocks every season, we’ve modified a few ultra-durable 1020 trays to have 1/4″ or 1/2″ hardware cloth glue gunned into the bottom, but we’ve also used 1020 mesh plastic inserts. (optional) if you’re going to do a lot of gardening & seed starting, we highly recommend you get an indoor grow light setup. Here’s the simple, affordable DIY grow light setup that we use. Step 1. Prep your seed tray. Prep your seed tray by placing the cardboard and parchment cutouts in the bottom, 1/2″ hardware cloth or a 1020 mesh insert, as mentioned in the supply list above. A single tray will hold up to 312 3/4″ x 3/4″ mini blocks. Step 2. Make your soil block mix OR go to the next step if you bought soil block mix. 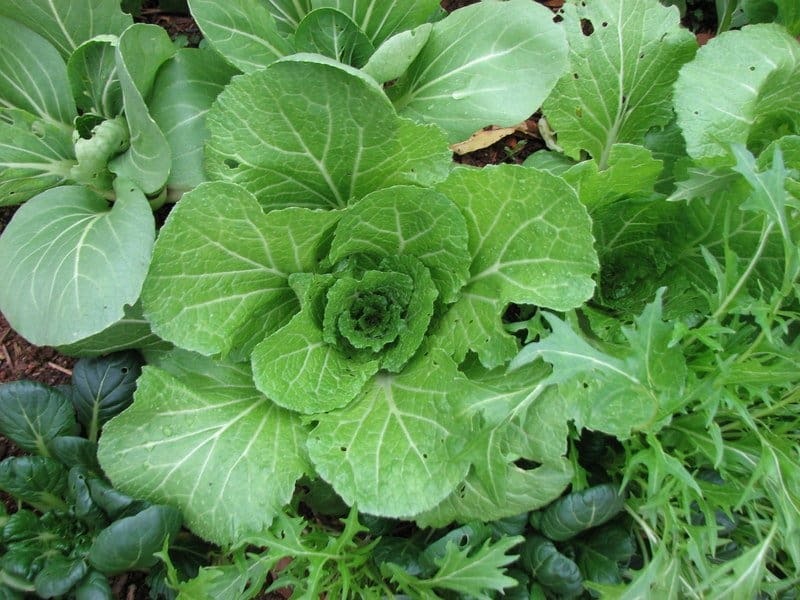 some people also like to mix in all-purpose organic mineral fertilizer at this point to reduce/eliminate the need to apply dilute liquid fertilizer as the seedlings grow. Step 3. Wet the soil block mix. If you’re using a soil block blend, or once your homemade dry ingredients are mixed, stir in water, then let mix sit for 30 minutes to absorb the liquid. You want the final consistency of the mix to be like wet oatmeal. The soil blockers will squeeze out a lot of water. Dip your small 3/4″ mini blocks into a bowl of water. This helps prevent the soil blocks from sticking to the metal as you push them out into your seed tray. 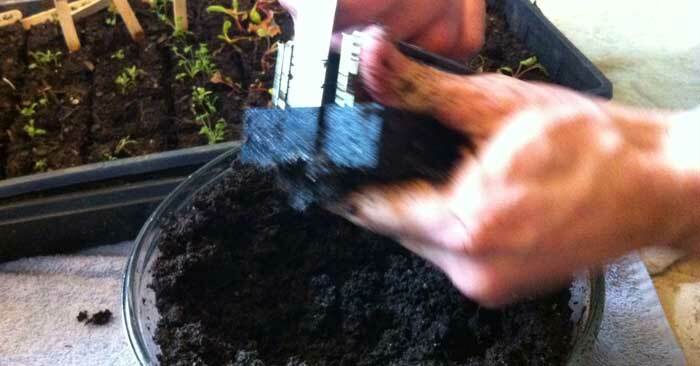 Push soil blocker into damp soil mix, twisting slightly back and forth as you push down. 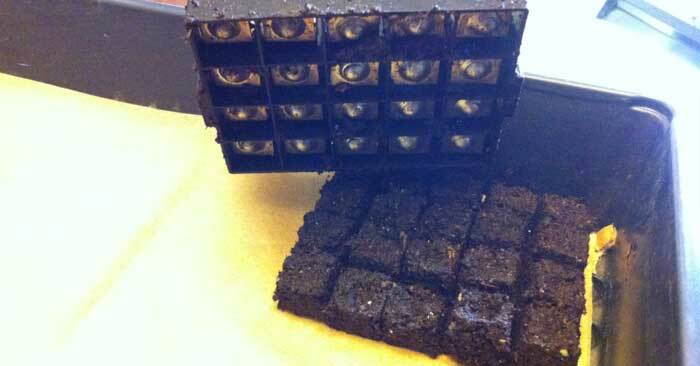 Soil should be very firmly packed into each blocker cube before pushing them out onto seedling tray. We find it helpful to run your hand along the bottom of the blocker evening/smoothing out the bottom of the blocks so they sit evenly in the trays. Smoothing the bottom of the blocks out so they sit level in their tray. Sorry for the blurry picture! Step 5. 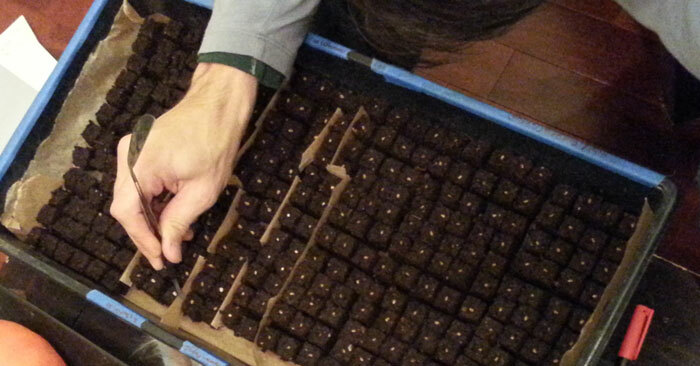 Push blocks out onto seed tray(s). 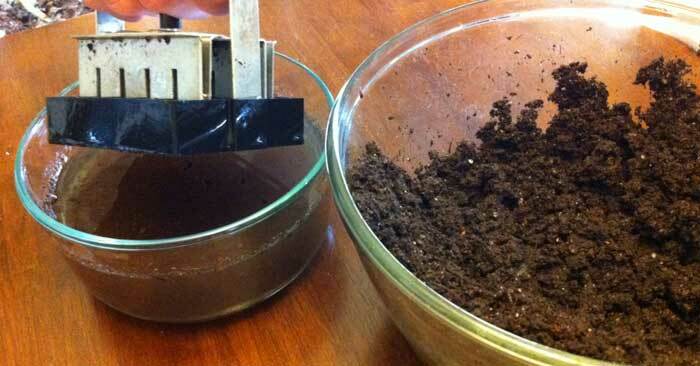 Push the soil blocks out of the blocker into position on your seed tray. If you position the blocker vertically, you can get 3 entire blocks snugly across the tray x 5 blocks lengthwise. We add the final rows of blocks by hand, for 312 total blocks per tray. Again, to help prevent soil blocks from sticking to blocker, dip blocker into water each time after putting soil block on tray, before making next round of blocks. Step 6. Label and record seed varieties. 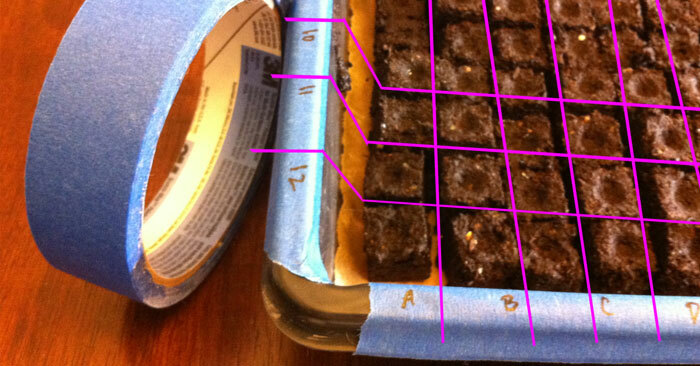 Place a strip of paint tape or masking tape onto one side & one end of your seed tray. Label the side A-Z and the end 1-12 corresponding to each row. If you’re using different seed types, make sure you note the placement of seeds in a google doc or excel spreadsheet. (Example: A1 – B6 = Peacevine Tomato, B7 – C12 = Aunt Molly’s Ground Cherry) Labeling your plants, from seed to harvest, ensures that you can grow the things you like best again, save seeds from them, or buy new seeds as-needed. We label our blocks using painters tape + a sharpie and record the information in a spreadsheet because traditional plant labels don’t work well with this many seedlings. Step 7. Add seeds & cover. Tip: when placing small seeds like brassicas we’ve found it helpful to wet a pencil tip and pick up & place the seeds in their divots. With flatter seeds like tomatoes, eggplants and peppers, using long-handled tweezers seems to make the job a bit easier. Placing tomato seeds with long-handled tweezers. The parchment is there to separate large blocks of the same type of seed – in this case most of these seeds are ‘Estamino’, an organic tomato rootstock that we use for grafting heirloom tomatoes for better disease resistance. Step 8. Cover tray and place on heat mat. Place finished tray on heat mat set to the ideal temperature range. If you’re doing cool weather seeds with lower germination temps, you won’t need a heat mat. If you have a dome for the seed tray, put it on now. If not, use saran wrap and tape to make a dome to ensure adequate moisture in the tray. You don’t need to have your grow lights on at this point since the seeds have not germinated, unless they’re light-dependent germinators. Step 9. Mist and wait. Using a spray bottle (one that lasts for years), mist the tops of the blocks each morning and night (12 hour cycle) until the seeds germinate to ensure they stay damp, but not wet, like a well wrung out sponge. There should not be standing water in the bottom of your tray. Step 10. Germination: remove dome, add light. Remove the plastic or saran wrap dome. After germination, a fungal disease called “damping off” can kill your seedlings if the moisture levels and air circulation are inadequate. 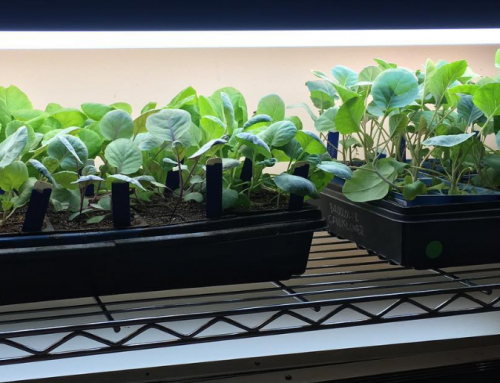 Put them under grow lights (here’s the DIY setup that we use). 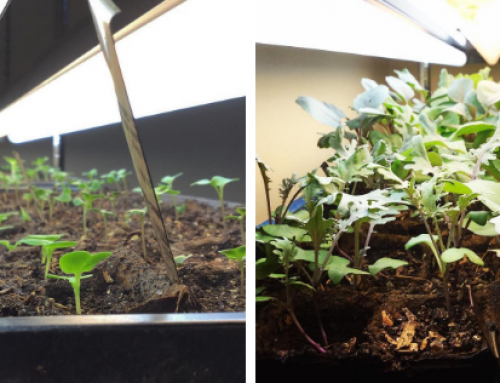 We keep our grow lights about 2-3″ above the top of the plants. 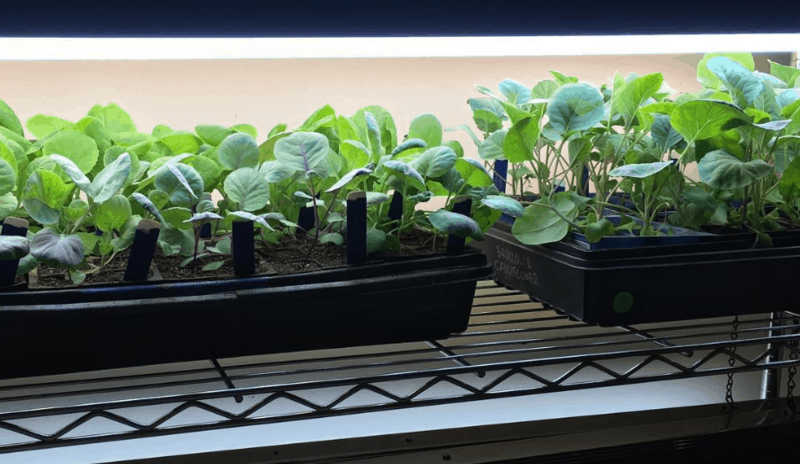 If you don’t have grow lights, keep them in front of a sunny, south-facing window; even then, with modern energy efficient windows, it’s hard for your seedlings to get enough light indoors without grow lights. Step 11. Cotyledons then true leaves. After germination, your seeds will send up plumules (stems) with small cotyledons (embryonic first leaves) on the tips. 7-10 days later, they’ll develop their first “true leaves” that resemble the leaves of the mature plants. As they get longer root systems, you can switch to watering by gently pouring water into the bottom of the tray. The plant roots will help hold the blocks together. The very healthy root system of a tomato seedling. The plants roots + the really compressed nature of the materials give the soil block stability, keeping it from falling apart when watered. Step 12. Block them up. Pepper seeds blocked up from the 3/4″ micro blocks into the 2″ mini blocks. Screen the dry materials – The above ingredients need to be passed through a sieve (we use a 1/4” hardware cloth nailed to a frame) in order to make sure they’re broken up and free of any “chunks.” Once sifted, thoroughly mix all dry ingredients together in a large bucket or wheelbarrow. Some people also like to mix in some all-purpose organic mineral fertilizer at this point to reduce/eliminate the need to apply dilute liquid fertilizer as the seedlings grow. Wet – Once your dry ingredients are mixed, stir in water, then let mix sit for 30 minutes before blocking. You want the consistency of the mix to be like wet oatmeal – if it’s too dry, your blocks won’t hold together. Step 13. Harden off then transplant. The time between germination and transplant should be 6-8 weeks; any longer and you risk stunting your plants due to inadequate root growth area. During this time, keep your soil blocks damp but not wet and keep your seedlings under 10-12 hours of grow light time per day. 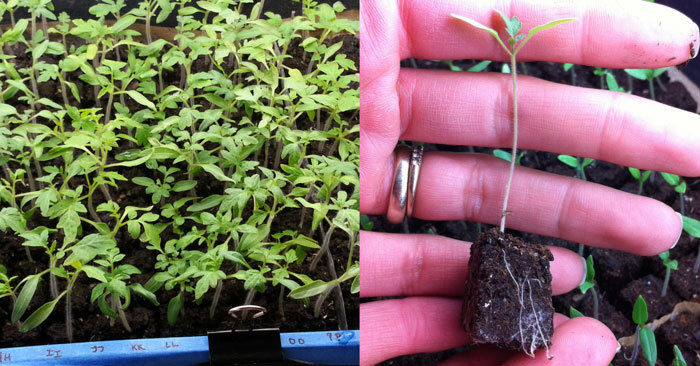 A week before transplanting, you’ll want to “harden off” your seedlings. This simply means acclimating them to direct outdoor sunlight, which is more intense than grow lights. If you don’t harden them off, they can become severely sunburned or be killed. Chicory hardening off before being transplanted. Due to its large taproot, chicory typically doesn’t start indoors and transplant well – but it does quite well in Ladbrooke soil blocks. Days 1 – 3: Place your seedlings outdoors in a shady spot that will only get 3-5 hours of direct sunlight throughout the day. 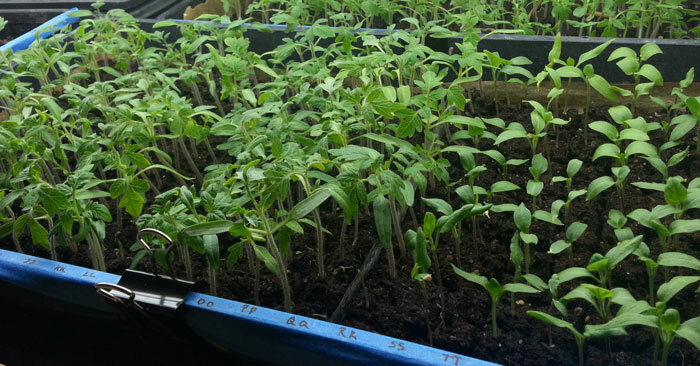 Days 4 – 5: Place your seedlings in a slightly sunnier spot that will get about 5-6 hours of direct sunlight. Days 6 – 7: Place your seedlings in a full sun spot. Finally, always check your 15 day weather forecast before transplanting your seedlings outdoors. Frost, freezes, severe weather… these can cause a lot of heartache, so plan accordingly! Read our article about tips for getting your new transplants established outdoors in their final spot in your garden.